The holidays are upon us! I love this time of year- the chestnuts roasting on a open fire, silver bells, sleigh rides, shoppers rushing home with their presents...have I been listening to too much Christmas music already? Probably. Definitely, if you ask my husband. I hope everyone had a great Thanksgiving! I sure did- I'm comfortable in my turkey coma and planning on spending the weekend in yoga pants, drinking healthy smoothies and filling up my wishlist!! Why? It's time for the TPT Cyber Monday Sale! I have been looking forward to this sale since, oh, September 6th. I've been trying to be better at long-range planning, so my wishlist has been filling up since then. I can't wait to have two whole days to empty it! Here's a tip: buy your big stuff on Monday, leave feedback, and then use your credits to buy the rest on Tuesday! What?! Mind = blown. In the meantime, I'm going to share the love in a big way. 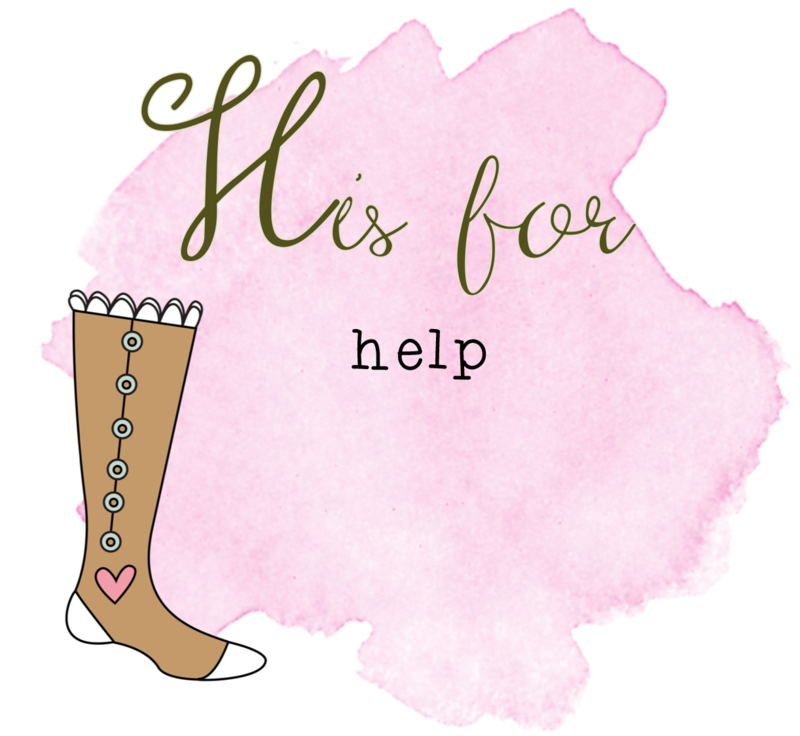 My store will be on sale Dec. 1 and 2, but in case you can't make it, I'm having a giveaway for $25.00 and $10.00 worth of products from my store. I'm also going to share my 12 Days of Elf-mas pack with you, because I <3 you and I'm sharing the love. Get it? 5. Have yourself a wonderful holiday season! We are going to be doing 12 Days of Elf-mas in my room- the elf will make her appearance on Friday the 5th, and each day will bring us a RACK to complete. Our elf won't be without some mischief, but the primary purpose of her visits will be to make sure my class is making December magical for others by RACK-ing. 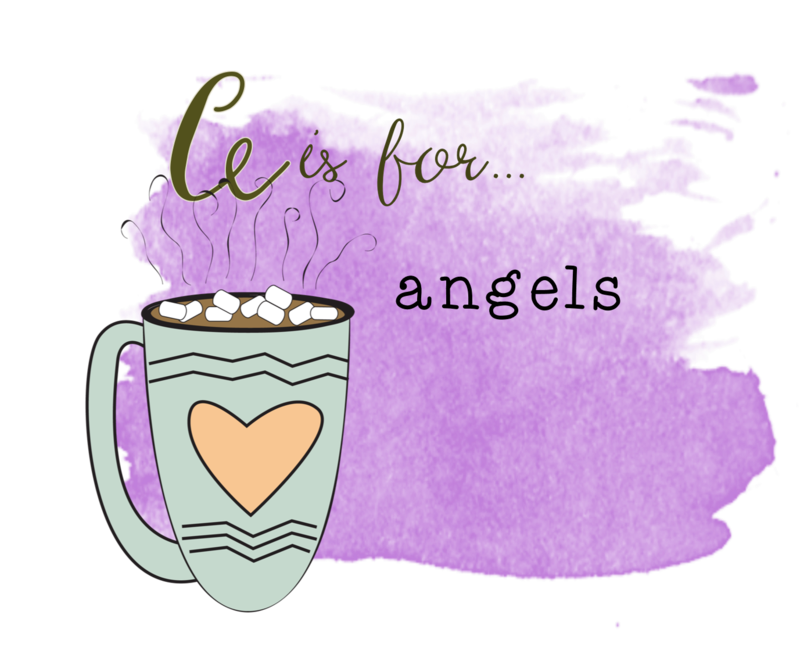 If you want to join in on the 12 Days of Elf-mas, grab the freebie here! Do you do RACK's with your students? Good luck with the giveaway, and go fill up those carts! 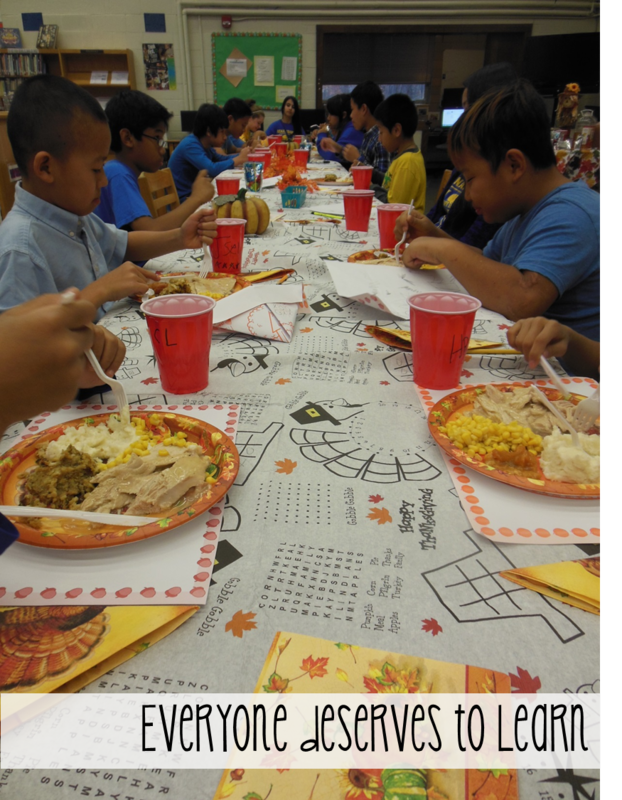 For the past three years, my teammate and I have thrown a Thanksgiving dinner for our students. It has become a cherished and memorable tradition for students, faculty, and staff. (Especially the staff who sneak in to eat with us!) 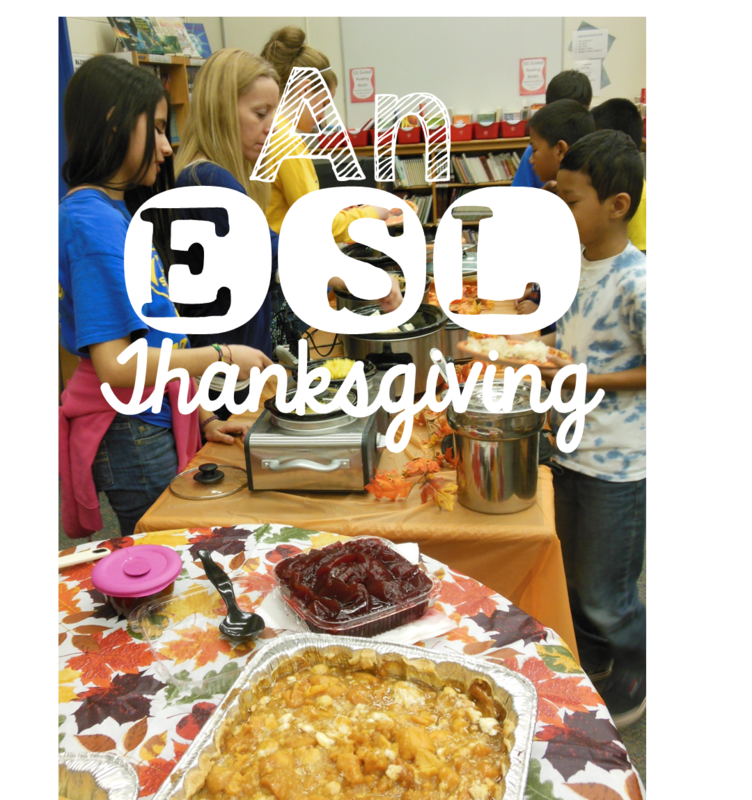 We round up all the ESL kids from their homerooms and bring them to the library, where we feast on every classic American Thanksgiving food you can think of. This year we were so fortunate to have a lot of our food donated by the Student Council. If you want to read about last year's feast, click here. Otherwise, relax (hopefully in your comfy yoga pants!) and come along for a photo-heavy re-cap! We took over the library and set up the tables family style. 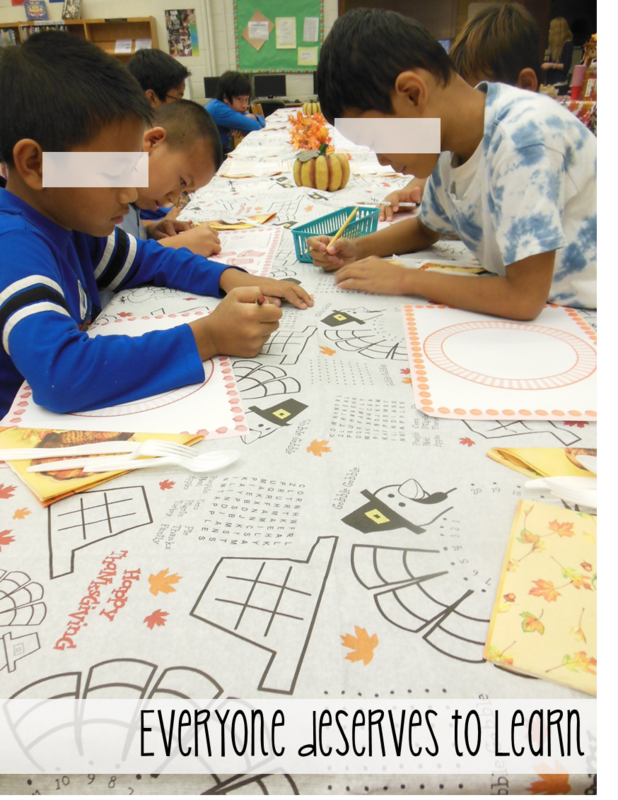 Last year we found fabulous write-on tablecloths at Boscov's (a NJ/PA store) and we stockpiled them for this year. While the kids were waiting for the food to heat up, they doodled and played tic-tac-toe. As my grandfather would say, "Abbondanza!" We always put plastic tablecloths down under our crock-pots in case of spills. This year my teammate decided to spruce up our food table with some autumn garland- isn't it cute? 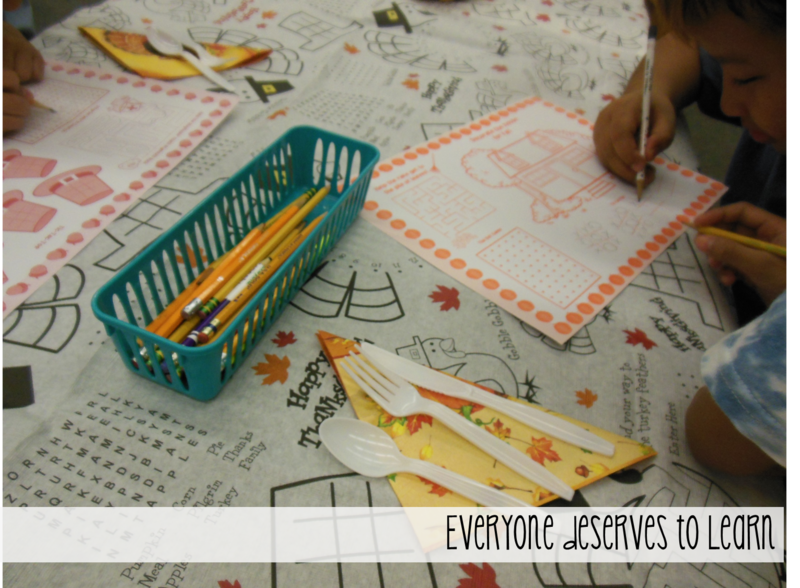 Before we served the food, we went around the table and each child had to say 1 thing they were thankful for. Most said food, family, friends...one smartie said he was thankful for his wonderful teacher. A plus! We were lucky to have Student Council help serve the food- that made it easy for my teammate and I to take pictures and sneak bites of food. 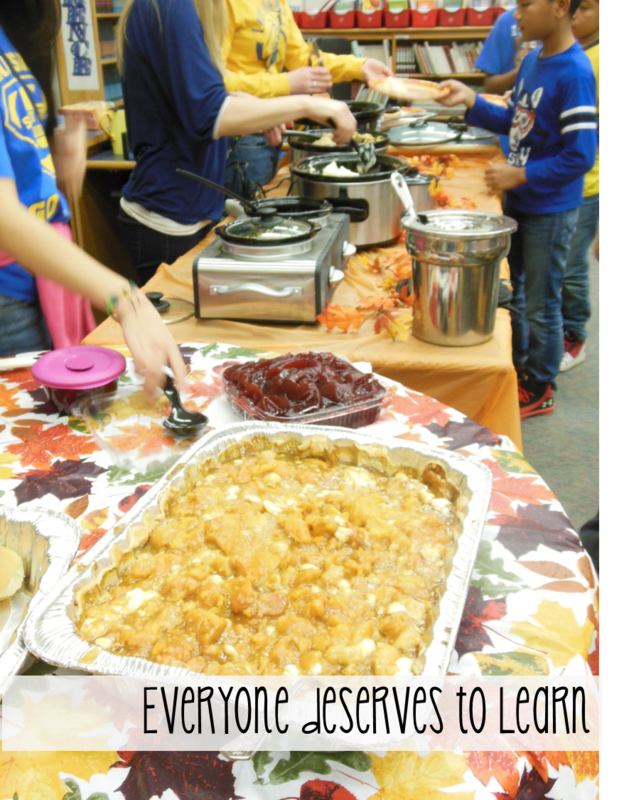 We got them to try almost everything, which is not easy- for some kids, this was the first time they'd ever seen stuffing or cranberry sauce! Finally, they ate. And there was silence. Total, complete, could hear a pin drop silence. 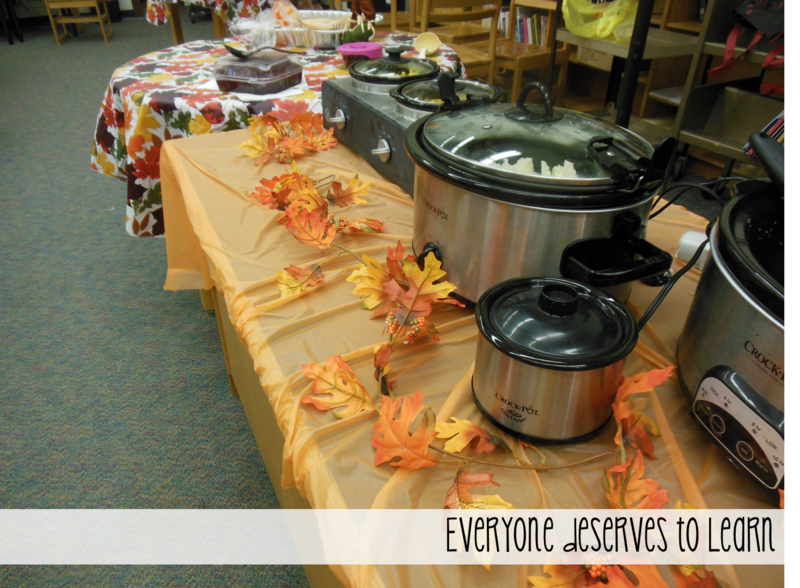 Some kids went for seconds, some kids went for thirds, but no matter what, they all left the library with food in their bellies and a story to tell. We sent loads of food home with the kids, so hopefully they'll eat well the next two days. I am so thankful for the opportunity to make a difference in my students' lives. Teaching refugees can be challenging and often sad, but seeing their happy faces and listening to them talk and giggle with friends around the table is so rewarding. Do you have any classroom or school traditions? Share in the comments! I have a lot to be thankful for. I have a great job, a beautiful house, a wonderful family, and you! 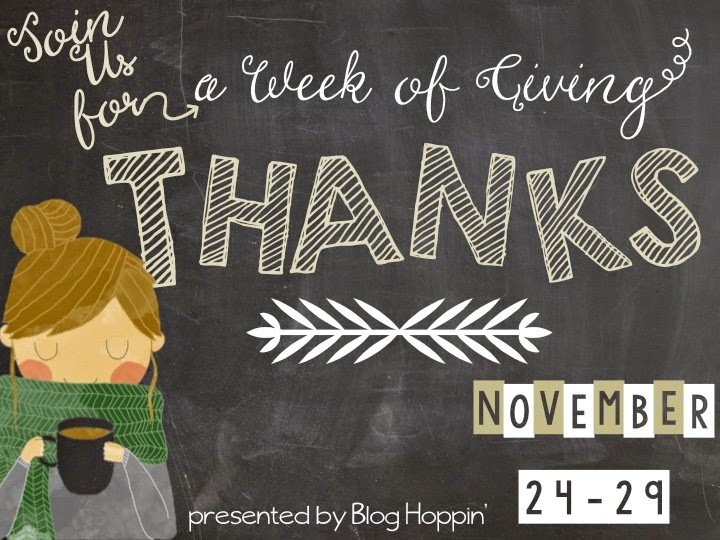 I'm linking up with BlogHoppin to share what I'm most thankful for this week. I am so lucky to work with some of the best faculty I know. I have a fabulous teammate in the ESL department, but I also work with so many talented people who really care about kids. It's true: I get by with a little help from my friends. I am not one to ask for help, but my friends and family know when I need it, and are always there to lend a hand. I know that my guardian angels are up there watching me- in the most stressful times I feel as though there's a hand on my shoulder guiding me in the right direction. 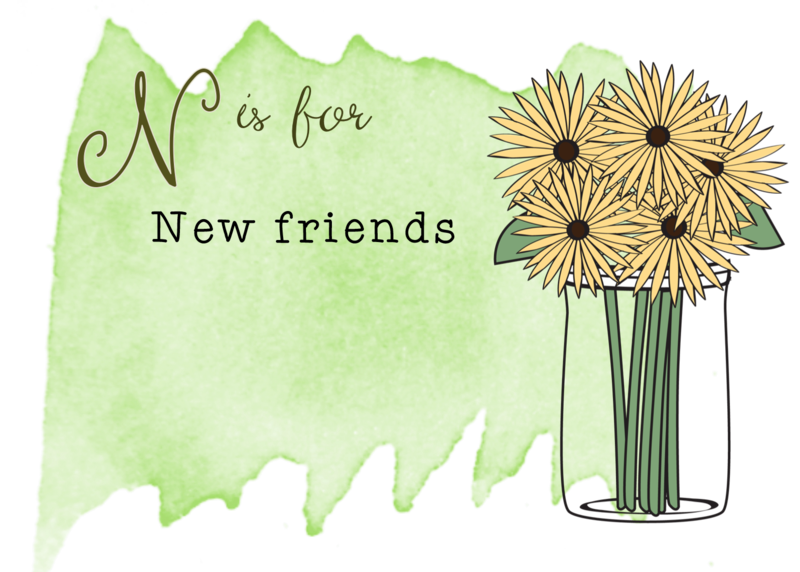 I'm so thankful to have made new friends who are teacher-bloggers and sellers from all around the country. I can usually identify a seller's product when I see it in the copier, and I'll say, "Oh, I know her!" Or I'll reference a blog post and say, "My friend ____ just wrote a great post about _____ in the classroom!" It's wonderful to have this online community. The fox knows a little about everything, and the hedgehog knows a lot about one thing. I think I'm a fox, but it might be nice to be a hedgehog once in a while! I am so thankful for the opportunity to continue my education- I tell my kids I'm in 23rd grade. At the rate I'm going I'll be in school until 35th grade, and that's ok! They make me smile, they make me laugh, they make me cry. We learn together as a family. I love my students and would do anything for them- they are a wonderful group of children, and I am a very lucky teacher. What are you thankful for? 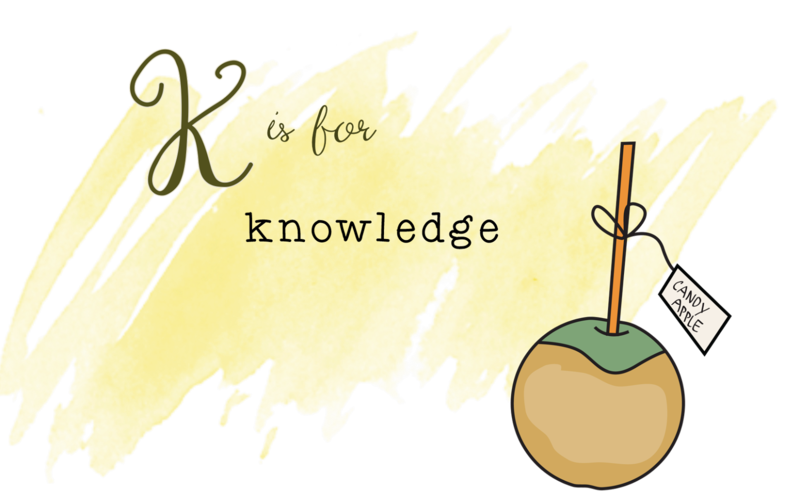 Link up with BlogHoppin! I apologize. It's just that I've had that song in my head ALL DAY! 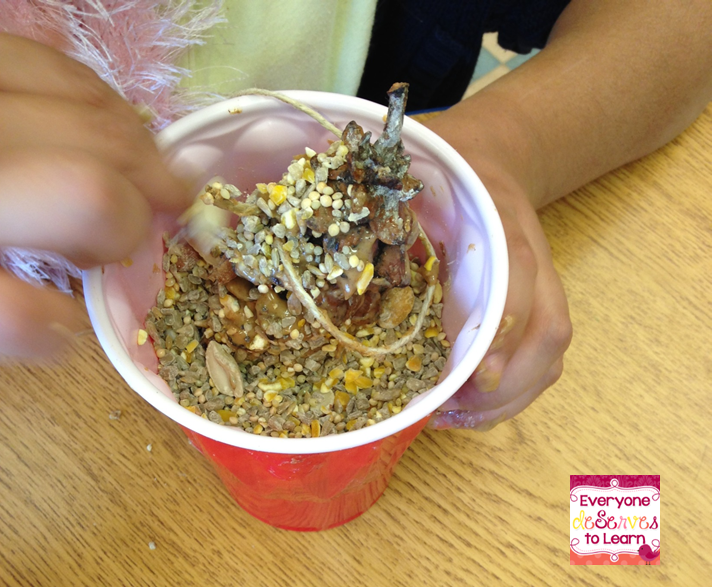 This week's lesson was all about forest animals and their habitats. We read about bears, owls, skunks, raccoons, beavers...you name it! 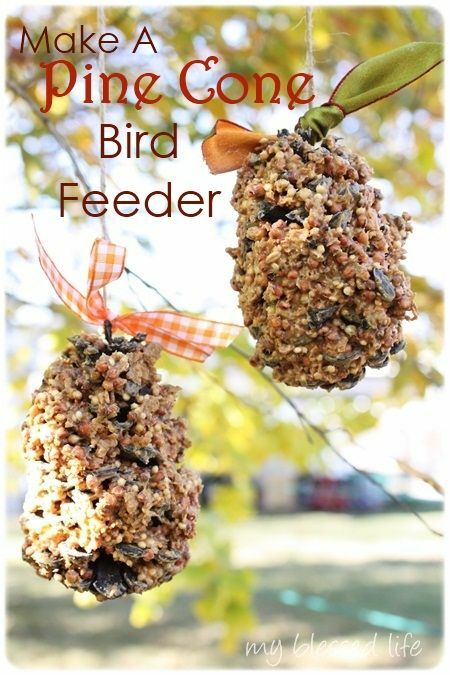 So I headed to almighty Pinterest to find a craft for my class. A few clicks later and voila! On my way to school (which is when I get all my best ideas) I decided to turn this activity into less of a review on habitats but more of a lesson on sequencing. The students in my 1st grade class are fairly proficient in reading and writing, but need a lot of work on fluent speaking. Scroll to the bottom to see the freebie I used! 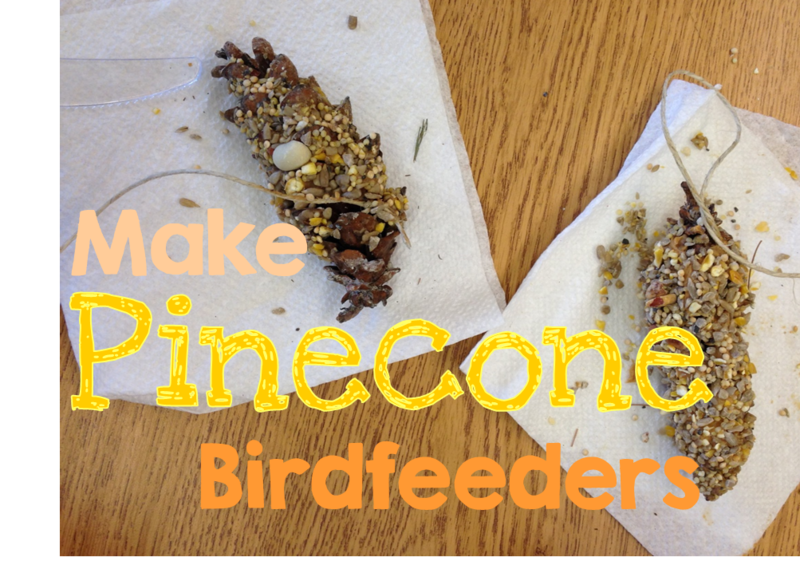 To make pinecone birdfeeders, you'll need the following: pinecones, twine or string, peanut butter/almond butter, and birdseed. I also grabbed some plastic utensils from my drawer to make spreading easier. 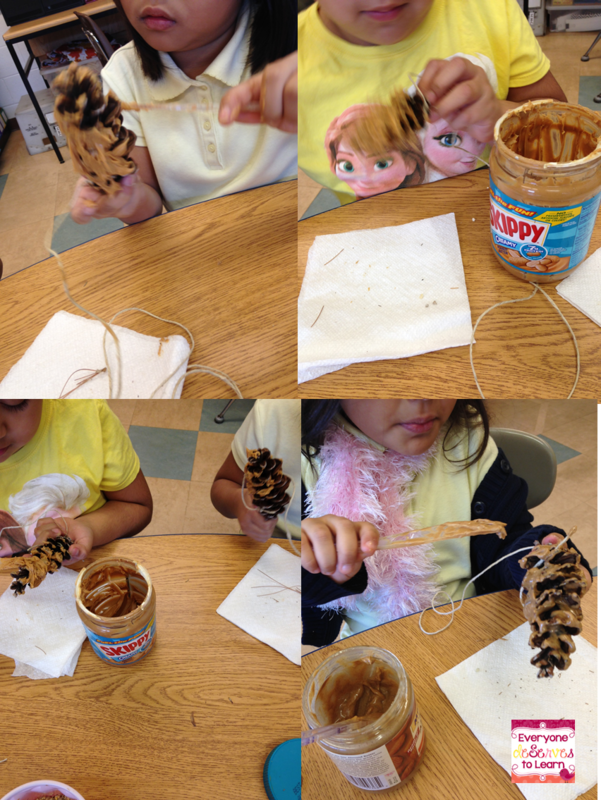 I tied the twine around each pine cone, then let the girls at it with the almond butter and peanut butter. We started off using plastic spoons, but that didn't work so well. After a mini mini lesson on being safe with a knife, I let them use the plastic knives. 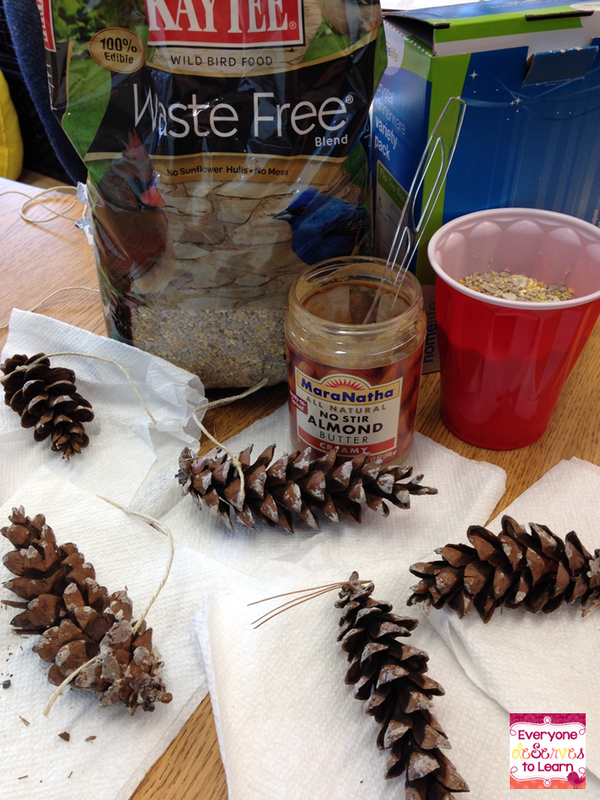 Once they slathered on the butter, we dipped each pine cone into a cup full of birdseed and twirled it around. That was an easy and non-messy way to do it- you dip it just like you would a chocolate covered pretzel. The girls were so proud of their creations. We put our jackets on and headed out to hang them up. 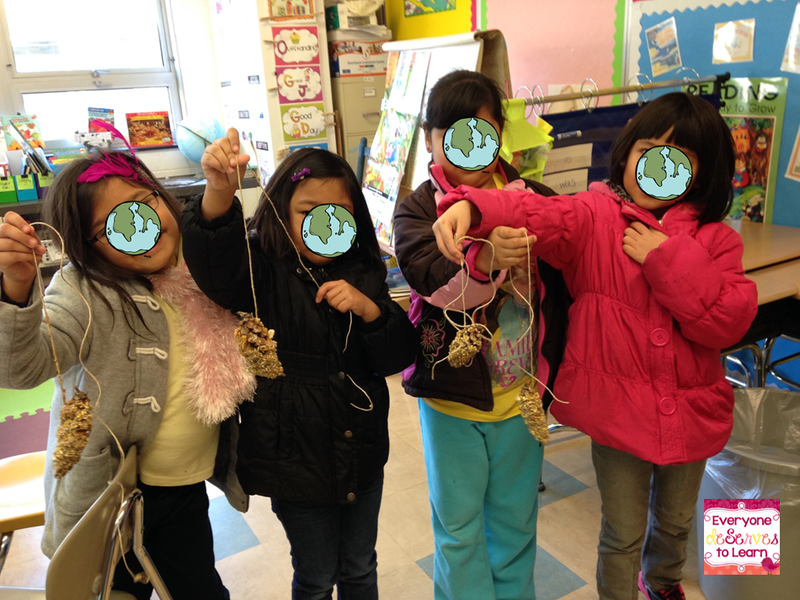 Each kid got to pick a branch for their feeder. The delight of choosing one's own branch was almost too much to handle. 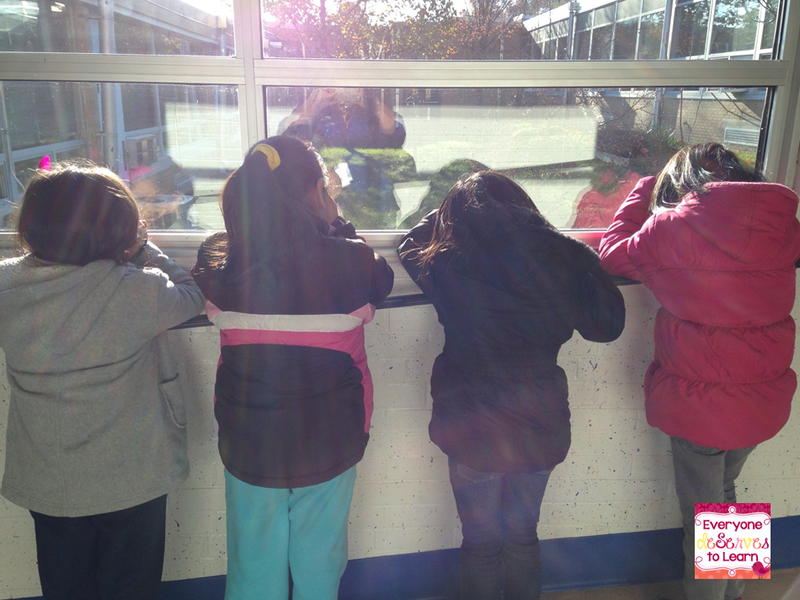 When we came in, we went right to the window in the hallway to watch the birds swoop to the feeders. I had to pry them away from the window- I promised that we'd be back at that window on Monday to watch the birds. Aren't they adorable?! Once back in the classroom we talked about the importance of animals in our environment, when to help them, and when to stay away. 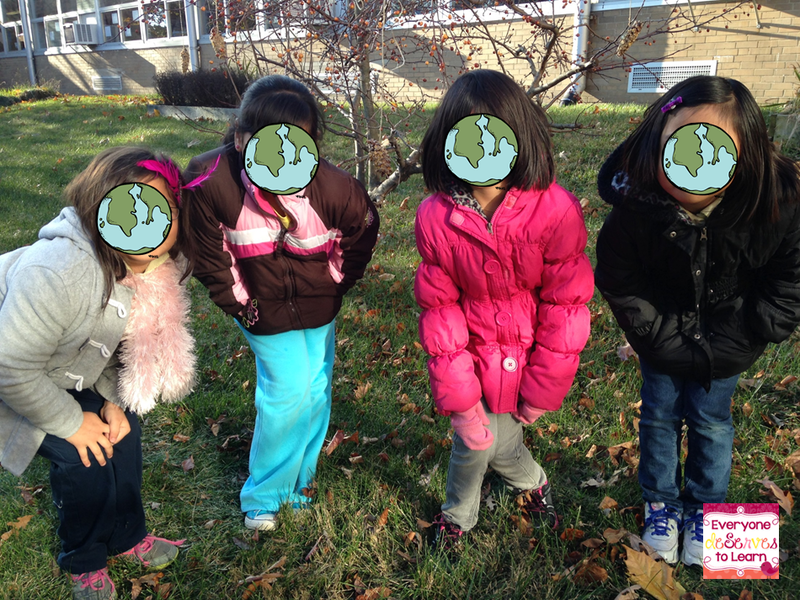 To sum it all up, we used my sequencing freebie and each girl took a part to explain. Click the picture below to grab it from TPT! This was such an easy and fun lesson- perfect for a Friday. 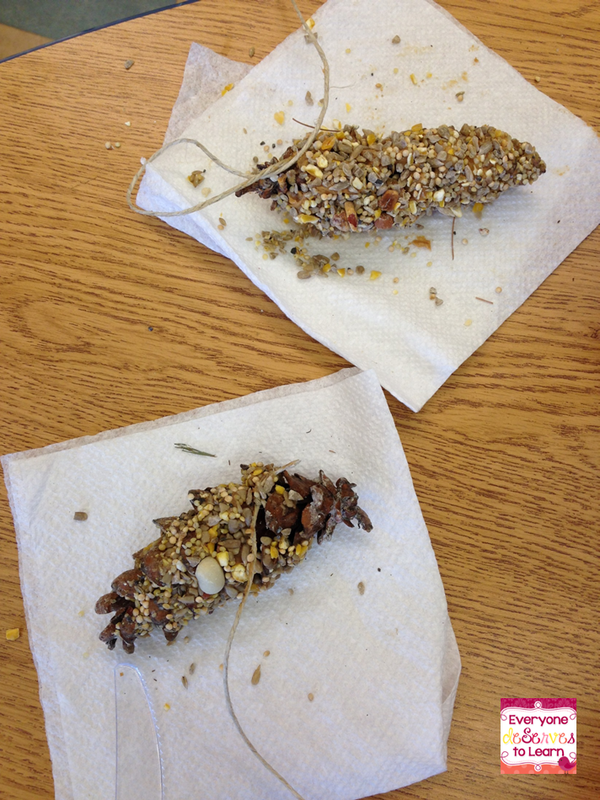 Have you ever made bird feeders with your class? Have a great weekend! Did you get the Holiday Toys 'R Us catalog in the mail yet? How about the one from Target? I did, and eagerly flipped through it to see this year's hot new toy. I've got to make sure I'm keeping up with the 8 year olds! Skimming through the pages gave me an idea for a mini lesson that is perfect for this time of year- the difference between wants and needs. At my school we have a large underprivileged population, and a sizable ESL population. Many of our ELL's are refugees from Burma and Thailand and came with their families to the US with nothing but the shirts on their backs. They were given some necessities by a local charitable organization, but then left on their own to figure out life in America. 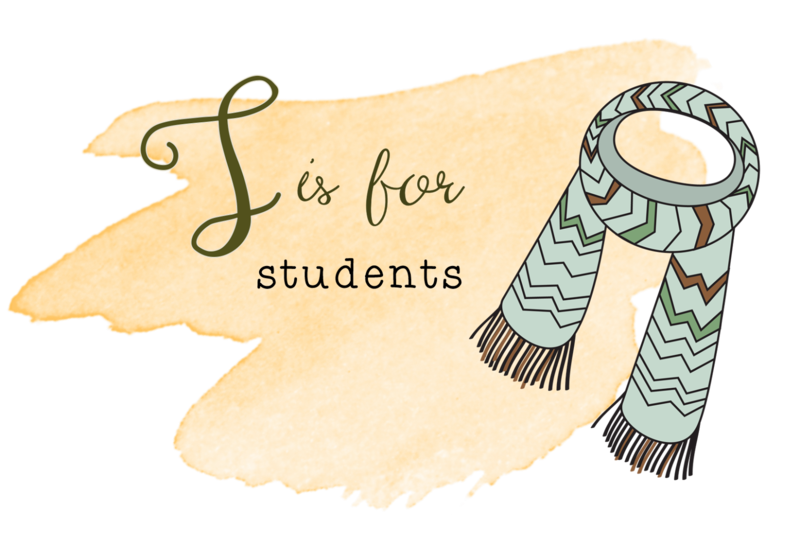 This is especially evident around the holidays, when their classmates chatter away about Santa, wishlists, and Christmas morning. Two years ago, my teammate and I decided to bring a little holiday magic to our students. We were able to give every ESL student a gift to open on Christmas. One of our 4th graders at the time had been desperately wanting a Barbie. She had never received a gift before, never unwrapped a package. When she opened her Barbie and car at our Holiday Party, she was so overcome she just sat there and cried. We cried, too. 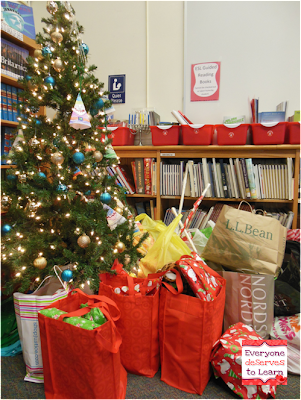 We'll be reprising our roles as Santa this year by getting donations from faculty and the community. If you want to read more about the holiday party, click the picture. Since this is our 3rd year in a row, we want to discuss with our students the difference between needs and wants. (Because Santa's money doesn't grow on Christmas trees!) Before our party, we always make a list of students' names, sizes, and wishlist so faculty can donate gifts if they wish. This year we thought we'd get the students involved in making their wishlist, but add a little twist to it. They'll have to tell us what they want, what they need, and as a little bonus, something they'd like to read. Click the picture to grab this form from Google drive. 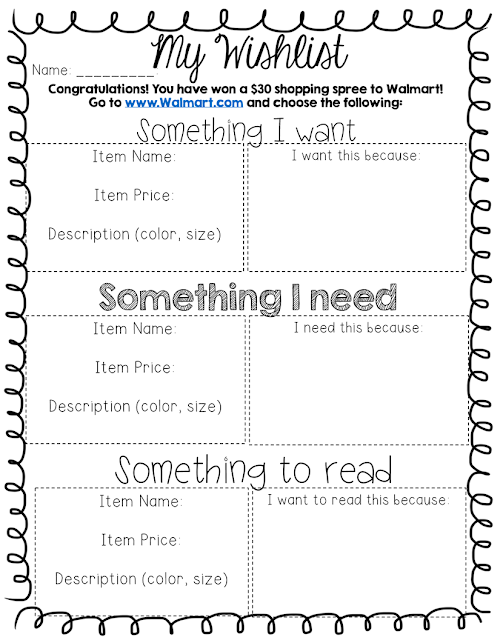 Once they turn in their wishlist, I'm going to show a BrainPOP video about wants and needs. The BrainPOP will come second so that they'll have background about their own wants or needs while they are watching. We'll take the quiz (they LOVE the quizzes on BP) and then play the game as a group or in partners. 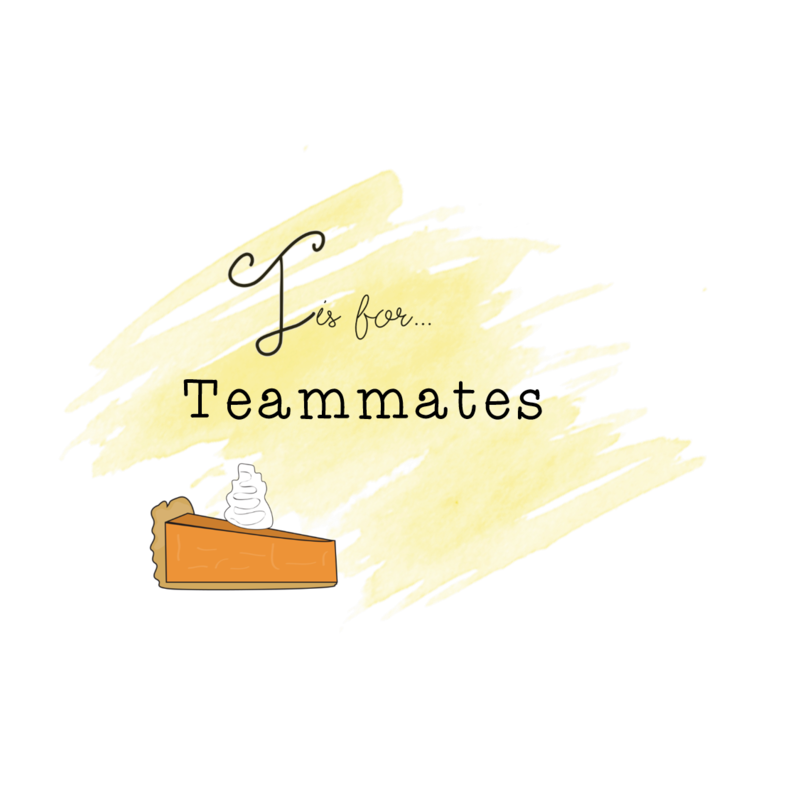 Click the pictures to go to BrainPOP. 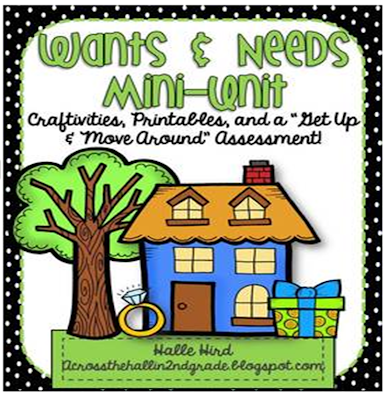 After we discuss wants and needs, we will revisit our Wishlists. 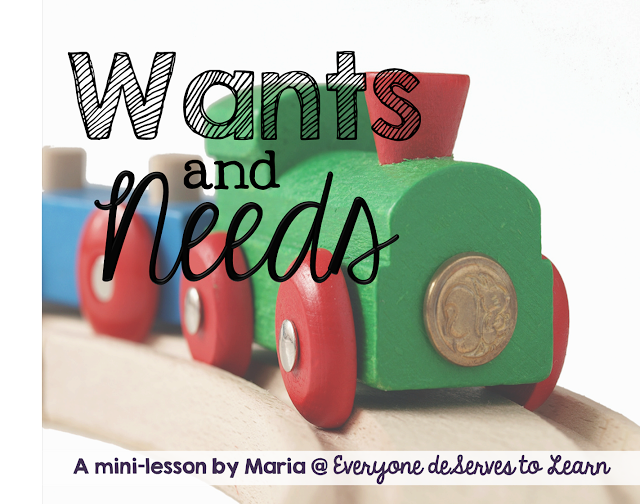 I'll model how one of my needs is actually a want, and I'll ask for volunteers to talk about their wants and needs. We will edit our wishlists, and then share some of our wants and needs with the class. As closure, I'll display some pictures from Google images and have them show me if it is a need or a want. If I find they need some reinforcements, we'll do some of the activities from my friend Halle's unit- check it out below. How do you teach wants and needs with your students? Leave me a note! Gobble Gobble! Thanksgiving is coming up soon- are you ready? 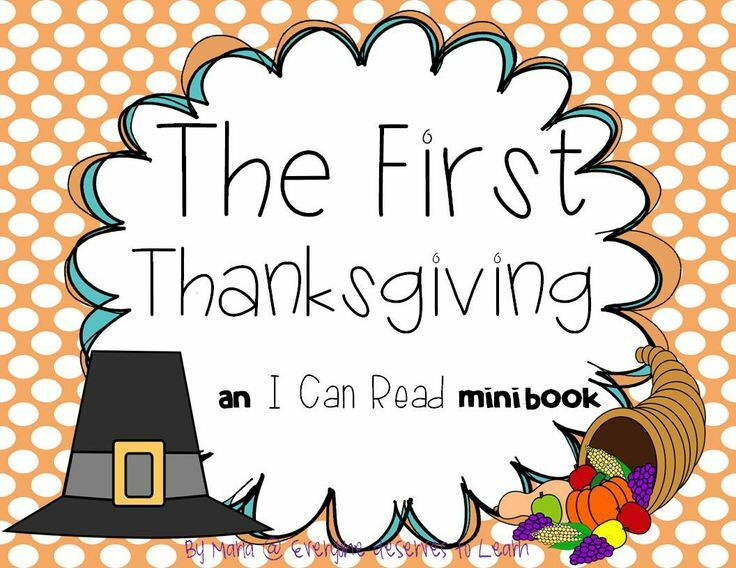 I need something about the First Thanksgiving, on a 1st grade reading level, with big-kid clipart and big-kid writing lines. 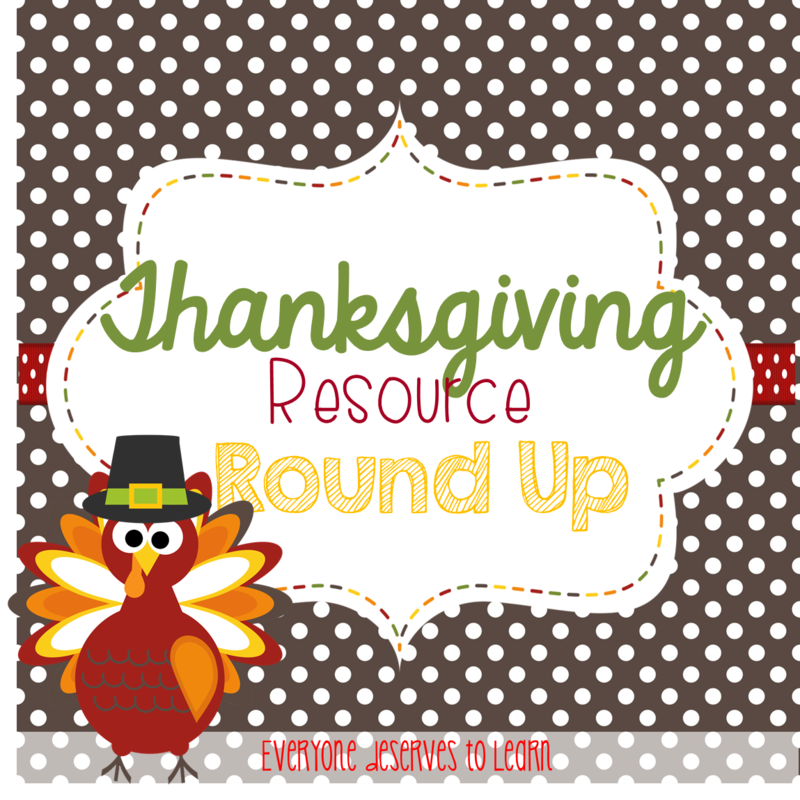 I spent a while searching for Thanksgiving resources on TPT, but couldn't find what I wanted. 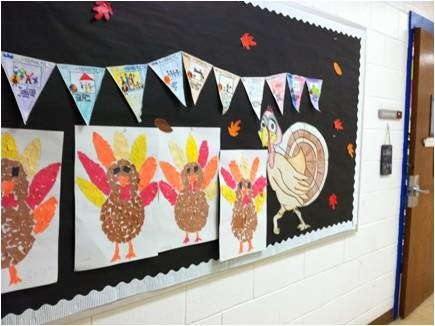 So, I thought it would be fun to get a link up going for all your Thanksgiving themed resources- hopefully I'll find what I need! 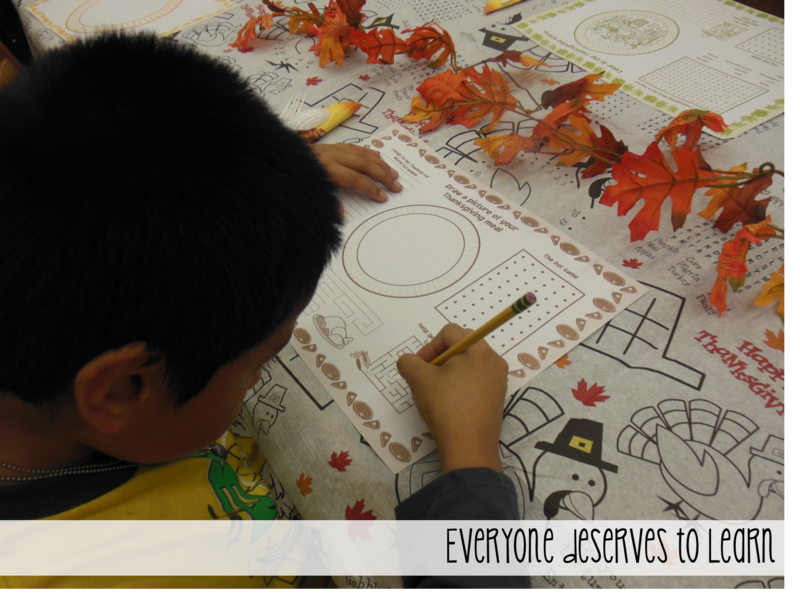 Join Everyone deServes to Learn with a Thanksgiving Resource Round-Up! Click any picture to head to my TPT store! This is the newest installment in the Diary of a... Series. I'm so excited to work on it next week! 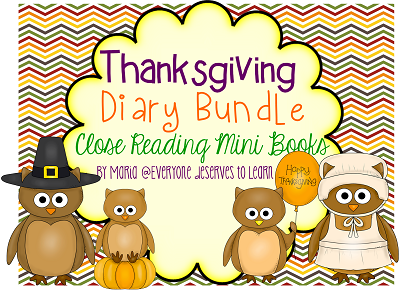 Right now there are two diaries in the Thanksgiving Bundle. A third is coming soon! 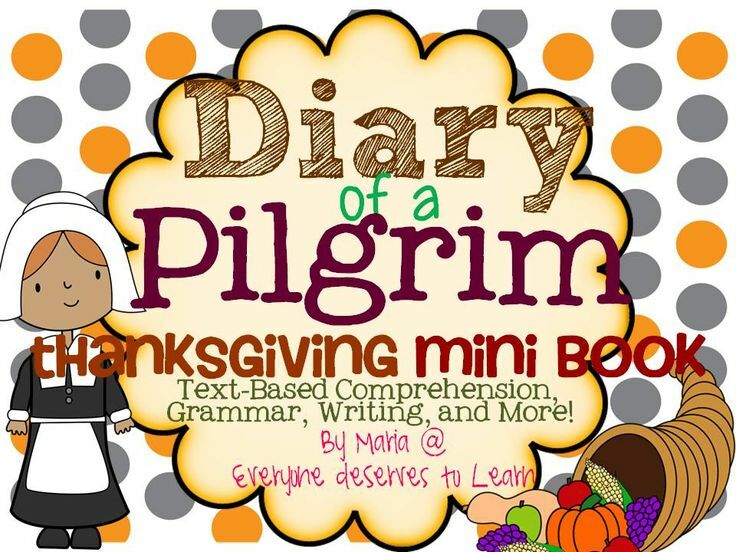 This is a great diary if you are studying Pilgrims. 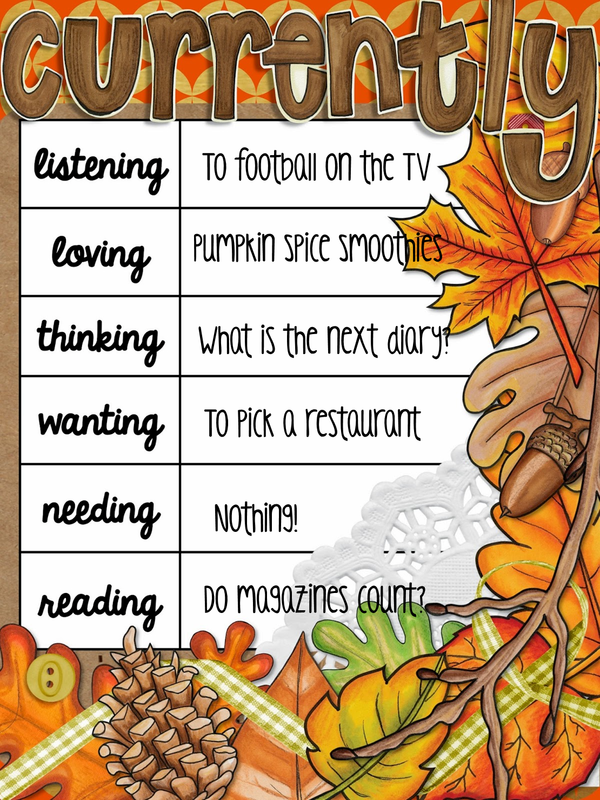 Use it as a read-aloud, for centers, or as guided reading. 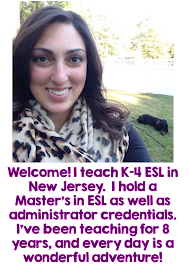 Last year I wrote this for my ELL newcomers. It's perfect for K and 1! 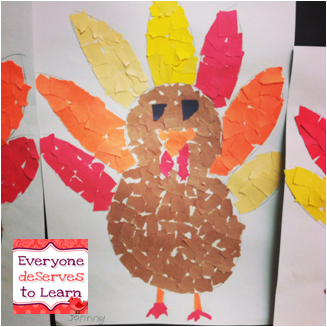 If you're looking for a fun craft, I worked on these torn-paper turkeys with my kiddos last year. Super easy and a crowd pleaser! What a beautiful way to start the month- all the trees in my neighborhood have changed, and the colors are just divine. I think November is my favorite month! 1. When we are home, the TV is turned to one of 3 or 4 channels: ESPN, Food Network, or HGTV. My little brother works at ESPN as a steadicam operator, so it's kind of become a game: "Can you spot DJ?" 2. I love a good #PSL, but let me tell you about the Pumpkin Spice Smoothie from Smoothie King. It is like drinking a pumpkin pie. In the battle of pumpkin spice, smoothie trumps latte, by far. 3. 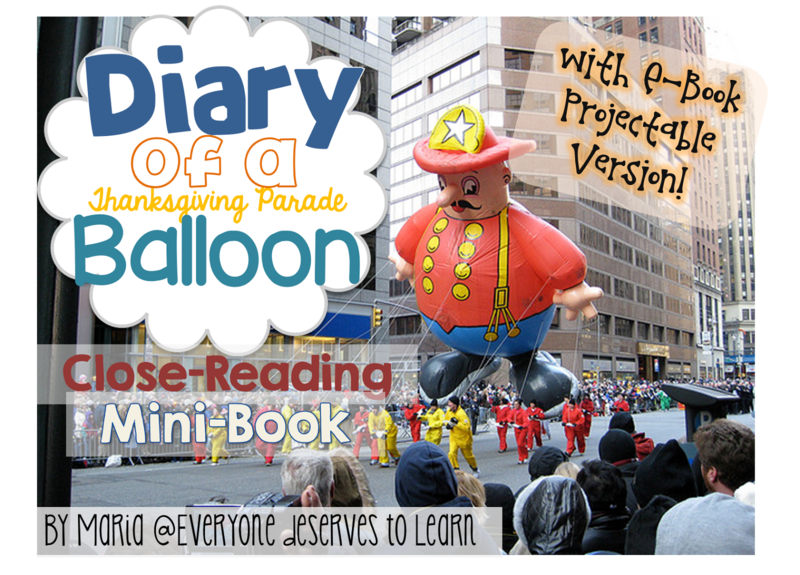 I just wrapped up a new Diary, and added it to my Thanksgiving Bundle- click the picture to check it out. I have three in my Halloween Bundle, so my OCD-self would like three in the Thanksgiving Bundle. I'm also thinking ahead to Christmas, and would like to write two more. Any suggestions? 4. Our third anniversary is at the end of this month, and we've planned a weekend in NYC. We'll do something he wants (hockey game) and something I want (Broadway show). What I can't figure out is where to eat. There are too many good restaurants to choose from. Living so close to NYC and Philly is not good for the waistline, that's for sure. 5. Nothing. I need nothing. I am so blessed with the life I have. 6. They're not periodicals or journals or peer-reviewed, and they are certainly not scholarly. I did learn some tips from Real Simple, though. Like this trick: Put a second garbage bag underneath the first so there is always a bag waiting. Mind. Blown. Happy November to you! I hope this month treats you well!